COLUMBUS, Ohio, September 19, 2016 – SSOE Group (www.ssoe.com), a global project delivery firm for architecture, engineering, and construction management, hosted a hospitality suite at the 77th Annual Conference on Glass Problems on November 7-10th at the Greater Columbus Convention Center. 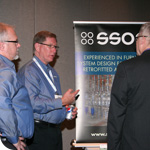 Multiple glass engineering experts from SSOE’s team were in attendance. This event was co-organized by the Glass Manufacturing Industry Council (GMIC) and Alfred University, the leading American glass teaching and research institution. As a leader in the glass and manufacturing industry, SSOE’s experience spans more than 50 years and 12 countries—-providing design and engineering services to nearly every major glass manufacturer. This year, SSOE was located in Hospitality Suite – Bellows E. For additional information on this event visit http://glassproblemsconference.org/.